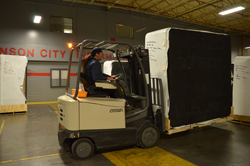 The Shipping Forklift Operator is responsible for the loading and unloading of freight, taking spas off the assembly line and prepping the spas for shipment. Previous forklift experience required. Position requires heavy lifting, pushing/pulling, bending/stooping, climbing, etc. Monday thru Friday 6:30 a.m. – 3:30 p.m. or 8:00 a.m. – 5:00 p.m.
Medical, dental, vision and various supplemental benefits available after 90 day introductory period. Paid holidays, vacation, personal and sick time available after 6th month of employment. Eligible for company 401(k) after one year of service. LPI, Inc. All Rights Reserved.